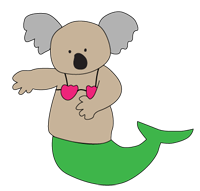 If you’ve wandered by our site in recent weeks, you’ve probably noticed a strange “sticky” post and a picture of a weird koala-mermaid gracing our homepage. I’ll explain. A few months ago, the Australian tourism office announced they were conducting a worldwide job search for an “Island Caretaker.” This person would live on the Great Barrier Reef islands for six months, keeping a blog and making videos to promote the islands. After three people independently emailed me the link to the job, and after I learned that another three people had emailed Ben about it, I became convinced that this was fate. I mean, HELLO? The job involved traveling, sitting on beautiful beaches, and BLOGGING. If you’re not convinced we are the best candidates for such a job, please refer to: this entire website. We took a risk and applied together, as a couple, rather than as individuals, thinking that our quirky interaction might add a funny element to the video, and might set us apart from the crowd. It could’ve also been what disqualified us, but we’ll never know. We didn’t get the job. BIG MISTAKE, QUEENSLAND. BIG MISTAKE. So our dreams of making $100,000 for six months of lying on a beach were squelched, and we’re back to the annoying and archaic concept of actually earning our money. Blech. PS: Shout out to my sister Lindsay for filming us! She was quite patient dealing with our demand for dozens of takes of each shot. Another shout out goes to Allison for her awesome artistic skillz.